Tiger Bill reviews American Drummers Achievement Awards Honoring Steve Gadd. On September 13, 2003 Steve Gadd was honored by the Avedis Zildjian Company at their second American Drummers Achievement Awards (ADAA) held at the Berklee Performance Center in Boston, Massachusetts. The event marked the establishment of a scholarship in Steve Gadd's name at the Berklee College of Music. Hudson Music has released more than six hours of footage from this event on a 2-disc DVD set. Let's check it out. The initial chapters of the first disc consist of tributes by Craigie Zildjian (CEO of Zildjian) and Debbie Zildjian (Vice President of Human Resources at Zildjian), Lee Berk (President of Berklee College of Music), Mrs. Armand Zildjian, Rab Zildjian, Louis Bellson, Anthony Jackson, and John Beck who was Steve's instructor and is Professor of Percussion at Eastman School of Music. 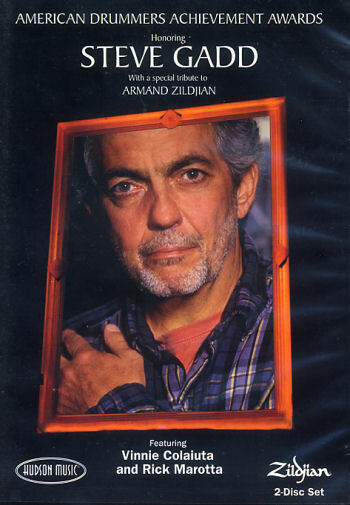 Also included is a video tribute to Armand Zildjian. The event is hosted by comedian Bill Cosby who, among his many accomplishments, is also an avid drummer. Intermingled with comments from Steve's friends and associates is a video documentary on Steve that takes us from his early years at the age of seven through today. Along the way we learn that Steve is not only a consummate drummer, widely praised for his work with a huge variety of artists on numerous recordings, but a fluent mallet player and tap dancer as well. According to Steve's long time friend, bass player Anthony Jackson, Steve's approach to each recording session is unique among drummers. Steve doesn't simply add a drum part, he literally orchestrates one for every song he records. At one point Vinnie Colaiuta, no lightweight himself, proclaims Steve "One of the most important drummers who ever lived." Interspersed with the various verbal tributes to Steve are some musical ones including: "Watching the River Flow" a Dylan composition performed by Will Lee on vocal with Rick Marotta on drums, "Dirty Old Man" written and played by Tom Scott with Rick on drums, a Chick Corea tune called "Nite Sprite" with Vinnie Colaiuta on drums, and "Subway" (originally played by Gadd with the band Stuff) with Vinnie on drums. The core band for these performances consists of Michael Landau on guitar, Larry Goldings on keyboard, Jimmy Johnson on bass, and Tom Scott on sax. A particular standout performance is when Vinnie Colaiuta and Rick Marotta tackle a composition for drumset originally written by Gadd called "Duke's Lullaby." Checking out how many drum legends you can recognize each time the cameras sweep the audience is also a lot of fun. Despite Steve's success over nearly four decades and literal worship by drummers and other musicians of every style, Gadd is known as a humble individual. This is evidenced in his acceptance speech. After Steve receives his award from Vinnie Colaiuta and Rick Marotta, he turns to the audience and says "We're all in this together. You inspire me. Thank you," which prompts a standing ovation. Another high point is when Gadd joins James Taylor on stage for a rendition of Taylor's "October Road." Steve concludes the proceedings by joining the core band on an Ellington classic, "Things Ain't What They Used To Be." Bonus footage on this disc includes the band members setting up their gear and rehearsing. Included are interviews with Steve Gadd, Steve's friends and fellow musicians plus rare footage of Steve playing in the Army band (circa 1970), Steve recorded live with "Stuff" at the Montreux Jazz Festival (circa 1976), a Video Tribute to Armand Zildjian, a Steve Gadd Career Documentary, photo gallery, and more. There is no doubt about it. Steve Gadd is now and has been for nearly four decades the single most recognizable name in drumming. As such, I would think every drummer would want to view this DVD as it offers a glimpse into the life and music of a man who is a true legend in his own time. I thoroughly enjoyed it and highly recommend it.